The Battle of Gettysburg is a landmark event in United States history. Widely recognized as the Civil War's turning point, it accounted for the most casualties of any battle during the war and spelled the beginning of the end for the Confederacy. In this powerful graphic history, Wayne Vansant describes the history leading up to the Battle of Gettysburg, as well all of the major military events on July 1st, 2nd, and 3rd, including the famous fight for Little Round Top on the second day and the death march known as Pickett's Charge on the third and final day. He paints portraits of each army's leaders, such as Robert E. Lee, James Longstreet, George Meade, and the then little-known Joshua Chamberlain. Vansant concludes a few months later at the dedication of the Soldier's National Cemetery in November, 1863, when Abraham Lincoln delivered one of the most iconic speeches of all time, the Gettysburg Address. "Gettysburg" delivers one of the hallmark events of American history in an exciting and innovative format. 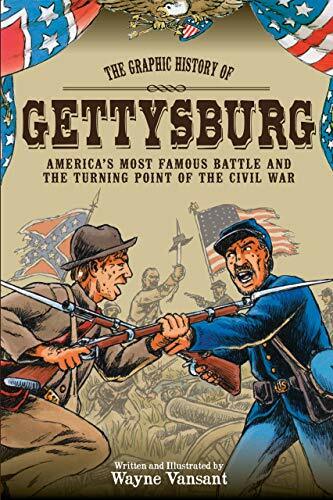 "Wayne Vansant has authored a graphic account of the Battle of Gettysburg with rich illustrations and narrative that makes history come alive. This book will not only spark an interest in the terrible battle and sad aftermath, but will provide the reader with a good understanding of the men and armies memorialized at Gettysburg National Military Park today." - "John Heiser, Historian, Gettysburg, PA"